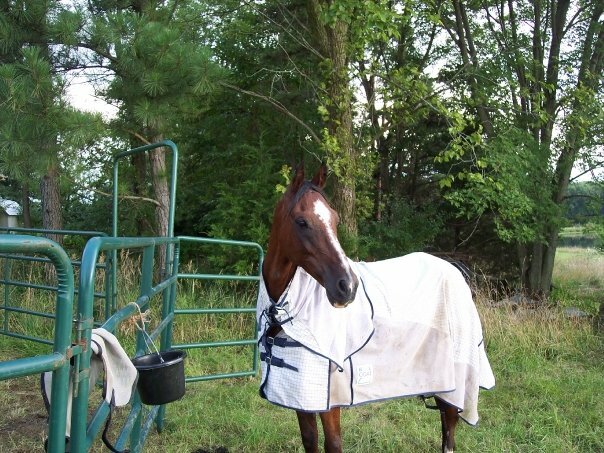 I’ll admit to being pretty new to the world of fly sheets -- I bought my first one back in 2009 when I rescued Jasper, and it was really only to hide his body condition from the neighbors so that nobody called the Humane Society on me until he recovered a little. Between 2010 and 2015, I usually kept a fly sheet on hand for Jack to wear when horseflies were at their peak -- he is the stereotypical thin-skinned TB and he HATES flies, horseflies in particular. Without a fly sheet, he would literally just race laps of the pasture the 4-5 weeks every summer that horseflies are bad here in MO (losing all the weight I fought so hard to put on him with every grain and/or supplement known to man). The fly sheet I had was the very heavy mesh type with a single belly strap and 2 leg straps. It was pretty hardy in terms of the mesh holding up, but very hot and he tended to rip the straps off with annoying frequency. 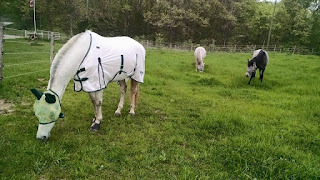 For a long time our horses were on 24/7 turnout, so using fly sheets was a bit of a chore in the sense that taking them on and off frequently to make sure there were no issues was kind of a pain. Couldn't find a pic of the heavy mesh one, but here was Jasper looking cute! In 2015, when the barn manager at ACS was placing a summer order to replenish fly gear supplies, she asked me if I wanted to buy a fly sheet for Ruby. I thought about it for a bit, then decided why not? By that point, she was in hard work, I was showing a lot, and I was looking for ways I could keep her more comfortable and happy. 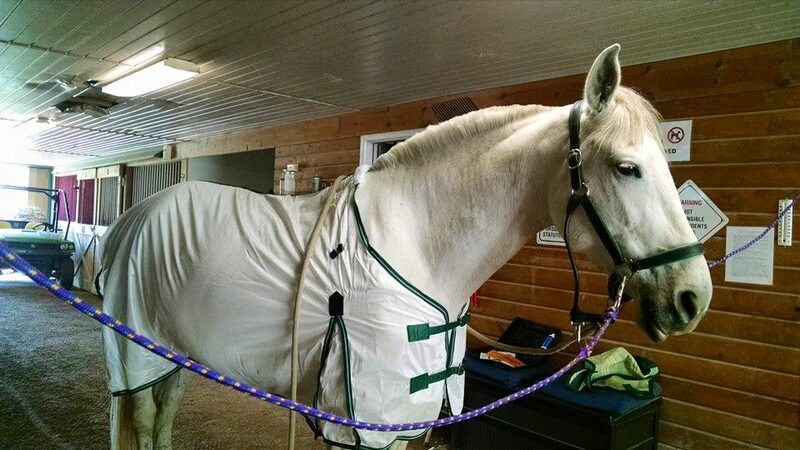 The brand most frequently used out at our barn is Saxon, and since they were reasonably priced (especially since we bought multiples), I decided to take the plunge. I bought ones for Topaz and Ruby, and started using them. A few weeks in, Ruby ripped a huge gash in hers and I thought to myself “well this was a complete and utter waste of money”. However, I went ahead and had it repaired, and to my surprise, that was the only incident all summer. Both horses were comfortable and happy all through fly season, and the UV protection helped keep Ruby’s coat from bleaching out (although turnout primarily at night helped with that too). This year, I purchased two more for the geldings -- a regular one for Trigger, and one with a neck for Jack (since he is more agitated by the flies). I used Topaz’s on Cinna for a bit, but she hasn’t quite grown into it and I lucked into one Cinna’s size dirt cheap at a tack auction so right now Topaz’s old one is my spare. In it’s second year of use, Ruby’s is looking a little rough around the edges, so I plan on replacing it before next summer (potentially patching up the old one to keep on hand as another spare), but I feel like two years of use out of it is a good trade-off for how reasonably priced it was. While you can get these fly sheets from a lot of retailers, I’ve had the best luck ordering from Stateline, especially if you’re ordering multiples, or if you have other things you can order from Stateline. They run 25% off pretty regularly, and often offer free shipping if you reach a certain dollar threshold (which of course is easy to do!). The only one we didn’t get from Stateline is Triggers -- they were backordered in his size and we needed it in a hurry, so the next best deal we found was Smith Brothers. Clearly not the best shot, but you can see Jack in the front. Mesh is much more lightweight and breathable than the ones I used previously, although they still do get hot when its 95+ (but I mean what fabric doesn’t at that temp?). I’m not saying it’s the lightest one out there by any means, but I like the weight. 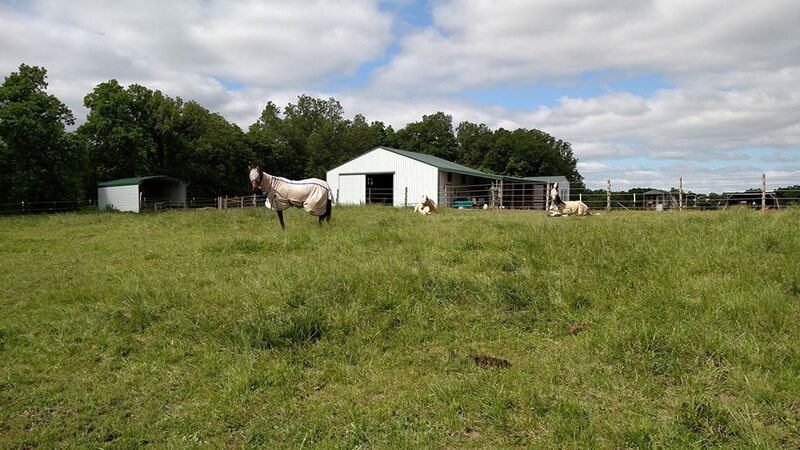 Sturdy construction -- my horses aren’t particularly hard on sheets, but aside from that initial tear Ruby made (probably on a fence or tree branch), they have held up pretty well to daily use during the summer. We use them from probably May - September (give or take a week or two). It has as belly band, which offers more coverage. I haven’t experienced any issues with shoulder rubs -- Ruby has a nylon shoulder guard she wears whenever she has on a sheet or blanket (due to some rubs the first winter she was blanketed) but my guys at home don’t have shoulder guards and I haven’t experienced any rubbing with them, so Ruby could probably go without and be okay. 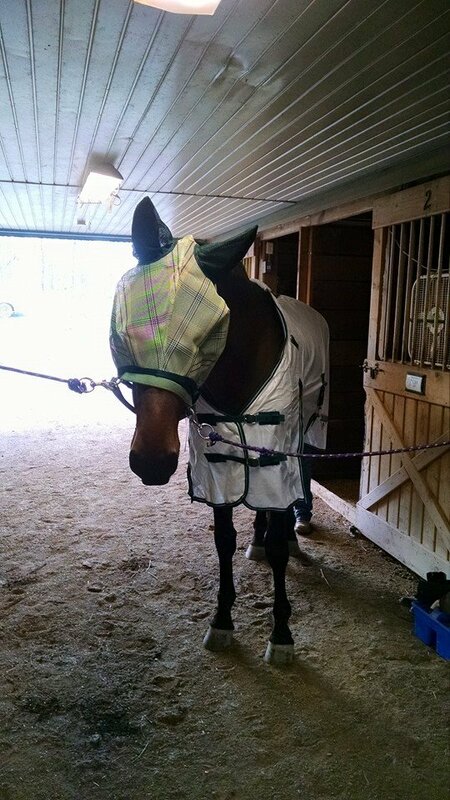 I’ve found them to fit pretty true to size -- my horses are mostly in 75/78s, which is the same size blankets most of them wear. On the subject of the belly band, Trigger always manages to soak his with urine, which is disgusting. However, Jack doesn’t do that, and the other gelding at the barn who has one doesn’t either, so maybe Trigger is just anatomically weird? I’m not a huge fan of the front closure -- it has some velcro and then the typical strap/buckle closure. For whatever reason, the velcro just doesn’t “stick” and so usually there is a gap in the coverage in the front unless you have the buckles done as tight as they will go. Mildly annoying, but not a deal-breaker for me. I’m marginally tempted to stitch the front closed once I have it properly adjusted, but I’m pretty lazy, so no guarantees I’ll get around to that. The neck portion (if you order that style) isn’t detachable. 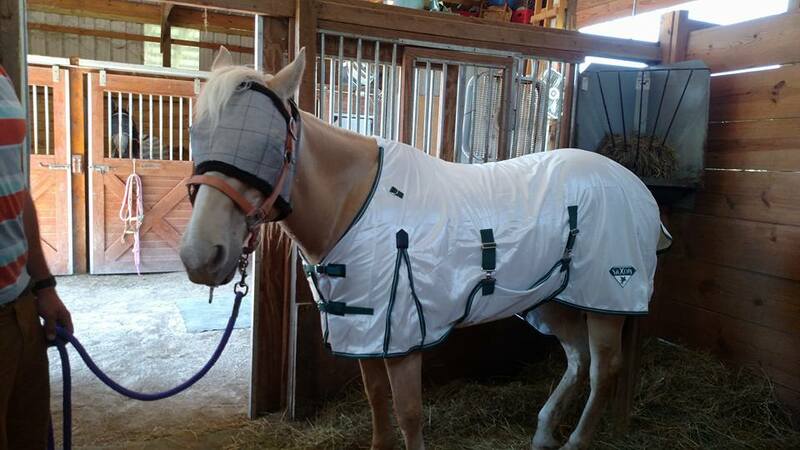 Doesn’t matter much to me, but I convinced my mom to buy one for her horse and she doesn’t like that. 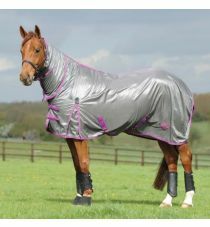 The Combo version is the one with the neck, and it also comes in gray with pink trim (that looks more purple to be honest, my barn manager had one). Price: 5/5 (I don’t mind paying around $50 if I know I’m going to get decent use out of it, and so far mine are lasting about 2 summers +/-). 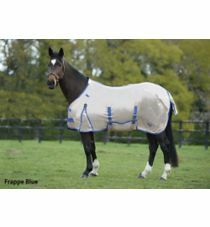 Do your horses sweat at all in these? We live in an area that gets very hot and humid, particularly in July/August. On really gross days, they do sweat under them. However, they would also be sweating even if they weren't wearing anything, so to me, the extra fly protection is worth it. I've never had any issues with any of the horses wearing them overheating or anything like that. I will say I find the horses less sweaty under these than I did when I use the really heavy mesh ones, FWIW. The barn where Ruby is does them every day. At my house, I'm not quite as dedicated, haha. 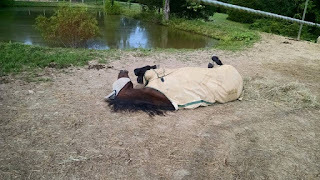 Last week when it was SO hot I left them off most nights and the horses were fine. But earlier this week I noticed the horseflies were out, so back on they go!